1. Sift the flour, baking powder, cinnamon and salt into a large mixing bowl. Make a well in the centre and break in the eggs. Add a little milk and start to whisk gently, gradually drawing in the dry ingredients and adding more milk as you whisk to make a smooth, thick batter. 2. Melt a small knob of butter in a griddle or non-stick frying pan until foaming and drop in 4 to 5 spoonfuls of the batter, leaving enough room for the pancakes to spread. Cook over a medium heat for a couple of minutes until little bubbles rise to the surface of the batter and pop. Turn carefully with a spatula and cook the other side until golden. Keep warm on a covered plate in a low oven while you cook the rest of the batter. 3. Meanwhile, grill the bacon until crisp. 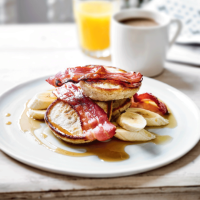 Pile 4 pancakes on a warm plate, top with the bananas and bacon, and serve drizzled with maple syrup.